There is nothing more frightening than hearing your child gasping for breath during a respiratory illness, let alone suffering from asthma. My own daughter wheezes at times, which she thinks is just a nervous habit. I am not convinced, but it does not seem to affect her ability to breath in and breath out. 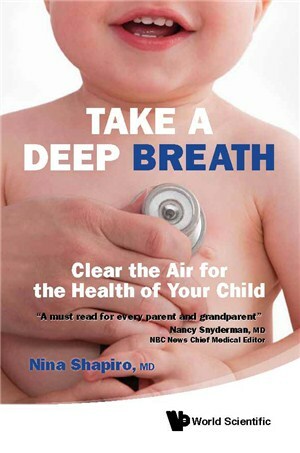 Take a Deep Breath: Clear the Air for the Health of Your Child by Nino Shapiro, MD thoroughly explains breathing from birth to age five. Take a Deep Breath is a comprehensive, accessible, and indispensible guide for parents, caregivers, teachers, pediatricians, and other healthcare providers on the subject of children s breathing issues. The book provides a thorough review of breathing issues, differentiating the normal and abnormal for all ages, and at all levels of breathing passages. Take a Deep Breath explains all of the puzzling and oftentimes distressing breathing patterns our children have throughout development. From the uppermost part of the breathing apparatus, the nose, to the lowermost part, the lungs, this book explains which problems are truly worrisome, and which are actually normal stages in a child s growth. Take a Deep Breath will enable the reader to do just that, take a deep breath, and get a better, clearer understanding about what s going on when your children breathe in and out. While pediatricians and other healthcare providers have expertise in all aspects of childhood illness, this book sheds new light on the latest research in pediatric breathing issues, sleep issues, and airway safety. Consisting of age-based sections, with location-based and problem-based chapters for each age group, each chapter also provides a ‘to-do’ list, offering successful preventions and treatments that can easily be done at home. We all remember suctioning our baby’s nasal passage…a very unpleasant experience for all involved. Dr. Shapiro’s advice is we may be a little “suction happy”. Suctioning can put “pressure on delicate nasal tissues, and can actually lead to more swelling and congestion”. Instead, she recommends more saline. Would I buy this book? Maybe. It is a good resource, and Dr. Shapiro does tell you when to worry and when not to worry. She answers a lot of common questions parents have, yet I think relying on your own pediatrician may be more valuable time and money spent. « Fukushima Update: Did Japan’s Nuclear Disaster Cause an Increase in US Infant Deaths? Thanks for sharing your opinion on this book for the tour!